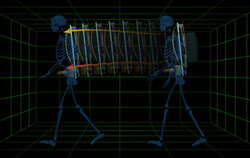 A Marine Biological Laboratory (MBL) biomechanics expert who studies how muscle moves skeletons in fish and frogs has invented a backpack that enables wearers to generate their own electricity. The Suspended-load Backpack is a piece of gear that will one day enable field scientists, hikers, explorers, soldiers, and disaster-relief workers to convert mechanical energy generated by walking with a heavy load on their backs into electricity. The Petrana Voice Commands for DVD 1.1 are now available from GFT Group Inc. at the Petrana web site http://www.petrana.net. A trial version for evaluation and demonstration purposes is available for immediate download. The trial version will cease working after 100 uses. The Petrana Voice Commands for DVD enable owners of Home Theater Systems that use a computer as the DVD and other media player to easily and comfortably operate and control their Home Theater System hands-free without a keyboard, mouse, or traditional remote-control. The Petrana Voice Commands for DVD are one component of the full Petrana system. The Petrana Voice Commands for DVD require Dragon NaturallySpeaking Professional, Medical, or Legal 8.1, 8.0, 7.0, 7.2, or 7.3. By carrying a load weighing from 44 to 84 pounds, backpack testers were able to generate up to 7.4 Watts -- more than enough electricity to simultaneously power an MP3 player, a PDA, night-vision goggles, a handheld GPS, a CMOS image decoder, a GSM terminal in talk mode, and Bluetooth. The electricity can be used while it is be ing generated, or it can be stored in a lightweight rechargeable battery for later use, greatly reducing the need to haul and use heavy replacement batteries. The Model Talker project exists so that people can record their own speech and convert it so it can be used with a text to speech synthesis program. The Inventory Tool software allows a user to read off up to 1650 words and phrases, which are then phonetically analyzed and converted into a synthetic speech model. The users voice can then be used in a text to speech program. This is especially useful for people with degenerative disabilities who expect to lose the use of their actual voice. If they "back-up" their voice, they will have the opportunity to use their own voice with an augmentative communication device (AAC or ACD). This software is currently available as a free download from Speech Research Lab at http://www.asel.udel.edu/speech/. When I tried this software, I found that it requires a lot of patience to use. I only recorded 210 of the phrases/words with InvTool, which was adequate to create a rough model of my voice for speech synthesis. It did sound like mesometimes. The software documentation indicates the more phrases recorded, the more accurate the speech model. For general information, visit http://www.modeltalker.com/. Makers of custom ergonomic chairs for people with special seating needs. They can custom make for bariatric clients and little people, as well as folks with fibromyalgia and degenerative tailbone disease. Their website had information on how to take extremely detailed measurements of people for customized seating systems. This company is the second generation of the Ergo Swivel Mop. These ergonomic mop and broom handles allow a user to comfortably maneuver around and under objects. The lightweight handle is contoured to reduce wrist strain. There are different handle designs for dust mops, brooms, and mops. Available from Alimed for just under $30. 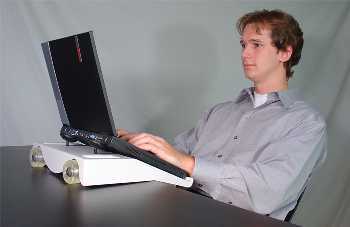 This stand is designed to lower and angle the laptop, allowing the user to recline, which is supposed to avoid spinal compression, improve circulation, and improve the viewing angle of the screen. The holder is counterweighted so it can hang over the edge of the desk, and has rollers so that it can be rolled out of the way. Cost is $79.99 from their website. Alimed carries the Goldtouch keyboards from this company, but I don't see this stand in the Alimed catalog. The Ztab ZKB-0501 Keyboard - Zeomi, Inc.
Flat keyboard designed for use by people who must Tab through forms a lot. Has an additional extra large tab key under the cursor arrow keys. To bad they didn't add a tab back key as well. Current Price is $39.95 plus shipping. Solutions for Humans (http://www.sforh.com/) is listed as a distributor, but I couldn't find this keyboard on their website. Old idea updated. 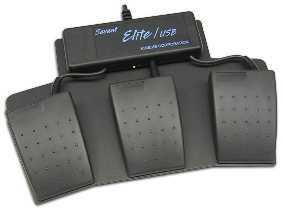 These programmable foot switches can be used with a variety of computer tasks to simplify or accelerate tasks. Possible applications include: used to press control, shift, or alt keys for one handed keyboard user, used to assist with clicking mouse buttons for users with hand tremors, and to provide access to macro programs. Multiple models available, including a 2 pedal ($129), 3 pedal ($149), or a 2 pedal ($149) or 3 pedal with jack ($169) for extra pedal ($30) or hand switch ($34.95). Alimed has several of these in their catalog. 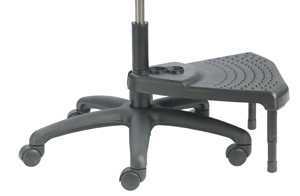 Step-N-Up - Neutral Posture, Inc.
Adjustable footrest that is mounted directly to the pneumatic post of stool or chair. Height adjustable from 7 to 12", and depth adjustable at either 13, 15, or 17" from pneumatic post. It has a 400 lb weight capacity, and list price is $150. AC and battery powered tape dispensers will automatically dispense, cut, and advance tape in a variety of widths and preset lengths. Their "most popular model", ZCM1000, can be found online for $598.50. 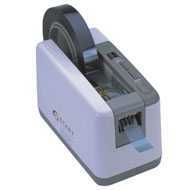 Their light duty electric tape dispenser, ZCM0800, can be found on line for $88 with AC adaptor.